Description of Coat of Arms: Argent on a cross gules a lion passant between four martlets of the first, in each quarter a sword erect of the second. Crest: A martlet argent. Source: Irish Families, Dublin, 1991, page 218. Nolan, seldom found nowadays with its legitimate prefix O, is the name of a sept of great antiquity which has always been associated with that part of Ireland which lies around the barony of Forth in Co. Carlow (not to be confused with the better known Forth in Co. Wexford). In pre-Norman days their chiefs, who held high hereditary office under the Kings of Leinster, were known as Princes of Foharta (modern Forth). After the invasion, though their power declined, they retained considerable influence. In the sixteenth century a branch of the Nolans migrated to Connacht and became extensive landowners in Counties Mayo and Galway, in which counties the name is not uncommon to-day. Nolan is among the forty most numerous names in the country as a whole, the great majority of persons so called being found, as might be expected, in Carlow and the adjacent counties. In 1878, however, Connacht landlords named Nolan possessed over 12,000 acres; but there was no extensive landowner of the name in or near Co. Carlow. There was also a small sept of O'Nuallain belonging to the Corca Laidhe group. (Possibly the Nolans of west Munster to-day stem from them). These, however, for some reason not apparent, were often called O hUllachain - thus in Lynche's De Praesulibus (1672) the two names are treated as interchangeable. In this connexion it may be mentioned that, according to Woulfe, O hUallachain is anglicized Nolan in north Connacht. As Knowlan and Knowland this name is noted in the "census" of 1659 as numerous in Longford and in the adjacent baronies of Co. Westmeath. In Irish the name is O Nuallain, I.e. descendant of Nuallan. The derivation of the name is obscure. the word Nuallan in modern Irish means a shout or cry, but it does not follow that the name comes from that. IN recent centuries few Nolans stand out as being particularly distinguished but several not unimportant persons of the name may be mentioned. Philip Nolan (1771-1801), an Irish emigrant to America, was one of the most notorious frontiersmen and contraband traders of those early days in the West; Most Rev. Edward Nolan (d. 1859), was Bishop of Kildare and Leighlin; two Nolans had some success in the literary field, viz. Rev. Frederick Nolan (1784-1864) as a Protestant theologian and Michael Nolan (d. 1827) as a legal writer; John Philip Nolan (1838-1912), of the Co. Galway Nolans, is remembered not so much as a soldier as for his political career during which he came into conflict with the notorious Judge Keogh and took the part of Parnell at the split of the Irish Parliamentary Party. source: Irish Families, Edward MacLysaght, Dublin, 1991, pages 136-137. James Nolan born February 2, 1828 in County Tipperary, Ireland. Arrived in America at age 22 on July 5, 1851, aboard the British Brigatine Fanny from Galway. Ann Mary Kelly born August 15, 1831 in Nenagh Parish, County Tipperary, Ireland. Arrived in America at age 20 aboard the Waterloo on July 2, 1851 from Liverpool. James and Ann were married on Feb. 2, 1854 in Wayne County, Ohio, and later settled in Moultrie County, Illinois. Ann died on July 9, 1896 in Dalton City, IL. James died Feb. 18, 1911 in Dalton City, IL. James later married Bridget Lynch who died Feb. 16, 1911. Nenagh is in the Province of Munster, County Tipperary, N.R, Poor Law Union of Nenagh, Parish of Nenagh and the Barony of Lower & Upper Ormond. The name Nenagh comes from Aonach Urmhumhan, meaning fair of Ormonde, and is situated in a fertile plain surrounded by the Silvermine and Arra mountains. It is the chief town of North Tipperary, and about 25 miles north of Galbally. Nenagh castle is one of the finest of its kind in Ireland, built in 1200 by Theobald FitzWalter one of the ancestors of the Butlers' of Ormonde. It is a hundred feet high and at its base 53 feet across. In 1860 the top portion was reconstructed. The Parish church of St. Marys' of the Rosary is a large Gothic revival building. The remains of a Franciscan Friary founded in 1250 by Bishop Donal O'Kennedy of Killaloe may be found on Abbey street. It was destroyed by Oliver Cromwell. Click Here for photos of Church. 1860 census Moultrie County, Township 14 R4E taken July 13, 1860. #645-646. James Nolan age 30; Ann age 30; Richard age 6; James M. age 4; Mary age 3; Catherine age 1. 1870 census Moultrie County, Town of Dora taken July 28, 1870. #127-125. James Nolan age 42; Ann age 39; Richard age 16 born in Ohio; Mary age 13; Katie age 11; Patrick age 9; Maggie age 8; James age 6; Ellen age 4; John age 2; Michael age 4 months. 1880 census, Moultrie County. Taken June 3, 1880. # 58-58. James Nolan age 52 born in Co. Tipperary; Anna K age 48 born in Co. Tipperary; Patrick age 20; Maggie age 18; James age 16; Ella age 14; John age 12; Michael age 10. All children born in Illinois. James Malacki: b. Feb. 2, 1856 in Dalton City, IL, unmarried. Mary Ann: b. June 6, 1857 in Dalton City, m. Peter Dunn. d. Oct. 19, 1925. Catherine Anastasia: b. Dec. 14, 1858 in Dalton City, m. John Cabot Shields. d. Nov. 14, 1940. Patrick Francis: b. Sep 17, 1860 in Dalton City, m. Mary Henrietta Dunn. d. July 13, 1929. Margaret Independence: b. July 4, 1862 in Dalton City, m. John Dunn. d. May 18, 1888. 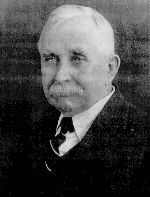 James Emmett: b. Feb. 21, 1864 in Dalton City. d. Aug. 15, 1894. John Henry: b. March 3, 1868 in Dalton City. Michael Tobias: b. March 24, 1879 in Dalton City, m. Anna Bresnan. d. Sept. 11, 1944. John, Mary and William Dunn are the children of Peter & Mary Dempsey Dunn. Mary Ann Nolan m. Peter Dunn on Nov. 28, 1882 in Sacred Heart Church in Dalton City. Peter was the son of William and Anna Dempsey Dunn. Edmond Nolan; 1834-1919. Catherine; 1834-1915. James Nolan died Feb. 18, 1911, age 83 years. Annie Nolan died July 9, 1896, age 64 years. 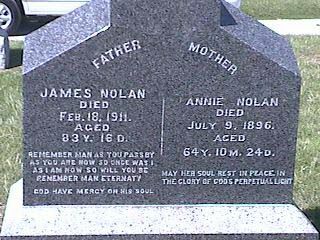 James Nolan died Aug. 15, 1894, age 30 years. son of James & Annie. Ellen E. Nolan, wife of William P. Dunn; March 17, 1864 - Aug. 27, 1901. John J. Dunn; 1861-1928; Katie Hughes Dunn; 1862-1930. "Dalton City: Mrs. James Nolan passed away at 5 o'clock Thursday evening at the age of seventy-six. She was born in Ireland but came to this country while quite young and spent most of her life here. The funeral was conducted Saturday at 10 am at the Sacred Heart Church and was conducted by Father Flaherty. A quartet composed of Misses Agnes Welch, Grace and Agnes Morrison and John Heneberry furnished the music. The pall bearers were: Mike and John Fitzgerald, Dan Bresnan, Will Burns, John Madigan and Will Hogan. The burial was in the St. Isidore cemetery." "Dalton City: James Nolan, an aged and highly respected citizen of this place, died Saturday at one o'clock pm, after a sickness of three weeks. He was born in Ireland in 1828 and when in young manhood came to this country and settled in Ohio. About a half century ago he came west and settled in what is now Dora Township, then a country thinly settled. He had watched this country grow from a raw prairie to the beautiful farms we now have. He bought land when it was low and at the time of his death was the owner of a large farm. Several years ago he and his wife moved from the farm to town and enjoyed a rest from their years of hard labor. He was a man well liked as he was of a very jovial disposition. His death was due to old age accompanied by the grip. His wife was buried just a week before he died. The funeral services were held Tuesday morning in the Sacred Heart Church and the body was laid to rest at St. Isidore. He leaves the following children: John and Richard Nolan of Red Oak, Iowa; Patrick Nolan of Jabez, New Mexico; M. T. Nolan, Mrs. Mary Dunn and Mrs. Kate Shield of Dalton City." Visit the Sacred Heart and St. Isidore pages on the Henneberry web site. James Nolan was one of the original sixteen founders of St. Isidore Church in Bethany, IL. God have mercy on his soul."